The first step to using Serato Remote with Serato DJ is to create a connection using one of the following connection methods. Before beginning, please ensure you have the latest version of iTunes and Serato DJ installed on your laptop. NOTE: You will also require Serato DJ supported hardware to be connected to your laptop before Serato Remote can be utilized. The easiest way to connect with Serato Remote is by connecting your laptop and iPad with a USB cable. • Connect your iPad to your laptop with an iPad USB cable. • Launch Serato Remote on your iPad and your Serato software on your laptop. • The connection should now be complete. Connecting with USB is a ‘Handshake’. It establishes a trusted connection which will make connecting wirelessly much easier in the future. To check that you are connected, enter the SETUP screen and in the Expansion Packs tab, select Serato Remotes. You should now find your iPad appearing in the Active Remotes window. An AD-HOC network is a wireless network connection between your laptop and other devices that does not require an Internet connection. It is our recommended wireless connection for both stability and security. Try clearing the location and privacy settings on your iOS device, and re-confirming your PC as a 'trusted device' upon USB connection. You can wipe Location & Privacy settings on your iOS device, via Settings --> General --> Reset --> Reset Location & Privacy settings. After wiping them, simply reconnect the USB connection to your PC, and the 'Allow Trusted device' dialog box will appear on your iOS device (choose 'Allow'). As obvious as it may seem, ensure your device is unlocked while trying to 'Activate' the device in Serato DJ. Try uninstalling iTunes, and freshly reinstall the latest version of iTunes, whilst your iOS device is connected. 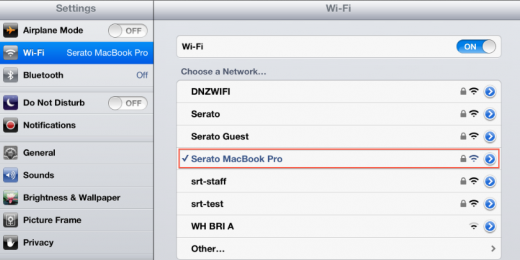 Connecting Serato Remote over WIFI is really easy, all that is required is that the iPad/iPhone & your laptop are connected to the same WIFI Network (and same SSID) and Serato Remote will show up under the available remotes list. Note: There will need to have been an initial 'handshake' (USB connection) for the device to connect over WIFI. Click the Airport icon and select ‘Create Network’. Type a name for your AD HOC network. Add a password for security [recommended]. 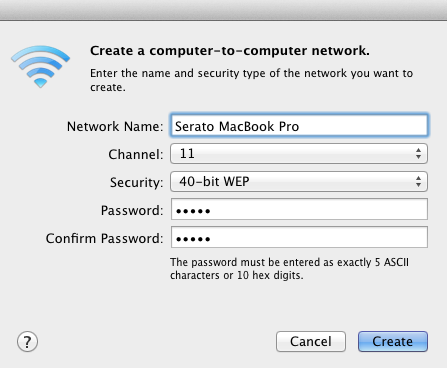 Select 40-bit WEP and add a 5-digit case-sensitive password. For example; 12345. Click 'Next' and then type a name for your ad hoc network. Select WEP and add a 5-digit password. Click 'Save this network', then 'Next'. 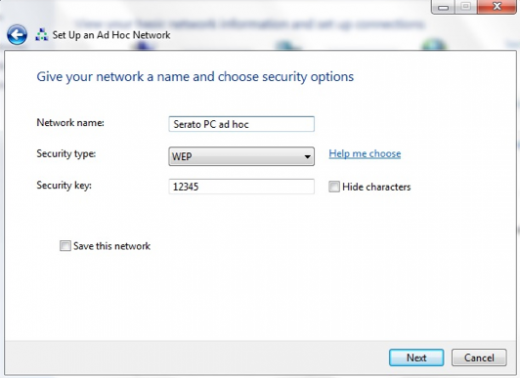 NOTE: Creating an AD-HOC network with Windows 8 requires additional steps. Steps 1-3 are applicable and can be found here. Select your iPad or iPhone in the Available Remotes section and click the 'Activate' button. Your laptop name should now appear on the Connection Home page in Serato Remote on your iPad. Select your laptop and you should now be connected and ready to go.